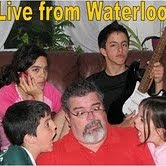 Live from Waterloo: WW#220 – Goal! Hurrah for arm chair tournaments! Love it! Looks like a lot of fun! Competing can be so fun! What a great shot! We have family game nights too -- and they look a lot like yours! porque no quisieron jugarme a mí... cagones... los hubiera dejado con tortícoles de pulgar a los dos.